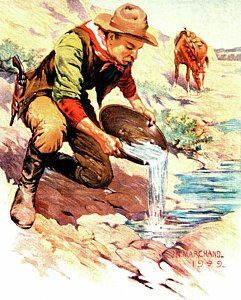 Lessons from the California Gold Rush — Realistic Prospects for Economic Development in Millard County — by Todd Macfarlane | RANGEfire! 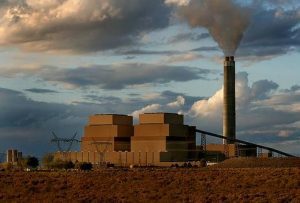 In Millard County, with IPP’s plans to shut-down the current coal-fired power plant in 2027, and possible replacement with a natural gas-fired power plant (which still needs to be permitted by the EPA, etc), that will only require about one-third of the current work force, the realities of a possible economic collision course, both with respect to jobs and property tax revenue, have become readily apparent. This is undoubtedly a real problem looking for a solution. Are there any silver bullet answers? Just as “technology” seems to be the ready answer to virtually any question these days, some have suggested that if there is a silver bullet solution, it is in the High-Tech industry and creation of tech jobs through the recruitment of tech companies to relocate in Millard County. Another Perspective. 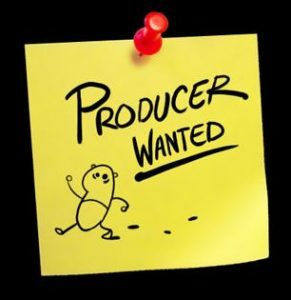 From the perspective of someone who both does work in the tech industry, and who is a partner in a large, masterplanned, mixed-use real estate project on the Wasatch Front that has been recruiting tech companies, including data centers, for over 10 years now, I want to address that issue. First a little background about our project: It is located in what is known and referred to as “Cedar Valley,” which is Northwest Utah County, west of Lehi, between Cedar Fort and Fairfield (30-40 minutes from downtown SLC or Provo). The 3000+ acre project, which is masterplanned for a healthy mix of commercial, industrial, and residential development (with entitlements for 9000 residential units (which would ultimately be a community of 30,000+ people), has now been fully annexed into Eagle Mountain. When we acquired the project, it included a private culinary water company, with a lot of extra water. Unbeknownst to many, not only do data centers require a lot of power, they also require a lot of water — to cool their servers. And we had plenty of water to put on the table. So like prospectors in the California Gold Rush of 1849, our project jumped into the fray and joined the Tech Rush of the 21st Century, and started actively recruiting tech companies, including data centers. 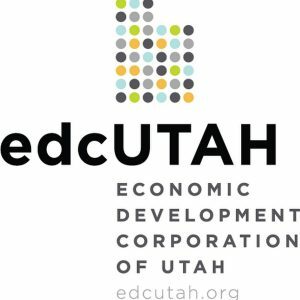 While it is true that GOED (Governor’s Office of Economic Development) and EDCU (Economic Development Corporation of Utah) are valuable resources, the reality is as long as they can land companies and jobs somewhere in the state, despite patronizing lip service to the contrary, they have no particular incentive to make anything happen in rural areas. 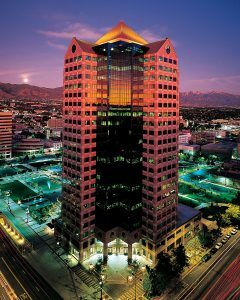 Over the course of the last 10 years, we’ve had plenty of high-profile meetings at EDCU’s headquarters on the 21st Floor of the Copper-topped Utah One Center in downtown SLC. From 2008 through 2012, we expended an inordinate amount of time, effort and money chasing tech companies. As I was writing this, I looked back through my emails to refresh my recollection about some of the economic development projects we chased. They all had code names assigned by EDCU — names like “Project Sparkler,” “Project Roosevelt,” “Project Wendel,” and “Project Big Patio,” just to name a few. In 2009, the tech giant Google, operating under yet another code name, was looking for a place to build a gigantic new data center. They sent site selectors to Utah. We were caught up in the heady adrenaline rush of the chase, so we spent boo coo bucks chartering fancy helicopters for the tour of our project. It’s the sort of thing that would seem like money well-spent if you actually landed the project, but if not, it was just pouring money down a rat hole. Like the California Gold Rush, chasing high-tech companies was an expensive proposition, and a big gamble, with fierce competition. Little did we know, in most cases the deck was already completely stacked. Competitive Realities. The first and most important thing to understand about recruiting tech companies are the realities of the competition. At this point, everyone seems to want clean and trendy high-tech companies and tech industry jobs. So competition is fierce. Once again, in most cases the deck is completely stacked from the outset. Flush Wasatch Front cities like Lehi, Draper and Saratoga Springs have a lot of resources, — and political muscle — at their disposal. And once again, as long as GOED and EDCU can land companies and jobs somewhere in the state, they certainly aren’t going to go out of their way to do any favors for places like Millard County. And I can guarantee the Silicon Slopes lobby is a whole lot more powerful than anything the would-be Silicon Sagebrush of rural Utah can bring to the table. And here’s another catch: a growing number of today’s most talented tech workers don’t even want suburbs, let alone the sticks. They want to live and work in highly concentrated urban settings. And they want to commute via public transit. There is an old saying that the three most important things in Real Estate are Location, Location, and Location. Well, every location is better, and more naturally suited for some things than others. But in chasing the big bucks, it is not at all uncommon to attempt to pound square pegs into round holes, in terms of location suitability. Been there. Done that. After spending several years and boo coo bucks chasing high tech companies, including data centers, we finally started getting more realistic about the competition, our location, and our prospects. Up to that point we were just chasing the Tech Rush. But then we started asking ourselves (and more importantly, GOED and EDCU) some really important questions about what unmet needs existed in the broader marketplace that our location might be better suited for. Contrary to our desire for the clean and trendy allure of high-tech companies, they quickly identified Heavy Industry as a more natural fit — primarily because of our more rural location, along the edge of the Wasatch Front. They said that because no one else seems to want heavy industry — including food processors and packing plants — because It’s often dirty, stinky, loud, no one seems to want it in/near their community. Consequently, in the supply/demand-driven system of the free marketplace, coupled with the realities of overregulation, much heavy industry was being forced out of the country, to places like China, India, Mexico and South/Central America — which meant that domestic competition was not nearly as stiff. And there were plenty of companies looking to get out of places like California, which have become too over-regulated to even be feasible. But there was also a catch — heavy industry virtually always wants good rail access. In order to attract heavy industry — even clean heavy industry, you have to have at least a railroad spur — which we didn’t have. So we looked seriously into what it would take to build a railroad spur to our location — a mere $20MM, on top of all the other infrastructure improvements we were working on and looking at. The bottom line is, even with very well-heeled and well-connected investment partners from the San Francisco Bay area (who donate very generously to BYU — in amounts well exceeding Millard County’s entire annual budget — each year), our project has now been working at this for over 10 years, and we’re still trying to find our niche. But so far, we haven’t found any silver bullets. 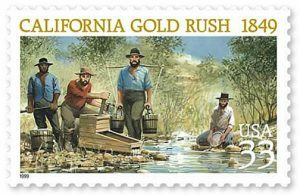 With the news that gold had been struck at Sutter’s Mill in Coloma, California in 1848, over 300,000 people ended up rushing to California to get in on the action. Think about that — 300,000 people using the primitive transportation and communication options available at the time. It was the largest mass migration in American history. And make no mistake, a very small handful of people did end up doing very well. But the vast, vast majority of them didn’t actually make (as in net) a dime. And many lost their shirts. In many ways, the Tech Rush of the 21st Century is like the California Gold Rush of 1849. Like many mining ventures, it was the epitome of gambling, both literally and figuratively. Location and opportunity were extremely important to striking it rich. Many of the people who actually profited most off the California Gold Rush were those who situated themselves to sell basic supplies, services, and necessities of life and business to the miners, including everything from picks and shovels to Levi jeans, boots, and assay services, transportation and security. Basic food stuffs, like bread, butter, eggs and cheese brought big bucks. It is estimated that during the California Gold Rush, in today’s dollars, eggs averaged about $90/dozen. 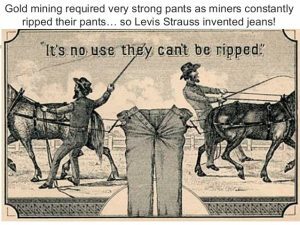 Levi Strauss made multi-millions (even in that era’s dollars), regardless of where it was located (in an urban center, with adequate workforce to meet the high demand for Levi Jeans). Back to Location, Location, Location. What, if any, natural niche(s) does Millard County enjoy? High-tech? What is it about Millard County, if anything, that would make it particularly well-suited as a high-tech hub? It has become an energy hub, there’s no question about that. With wind, solar and coal-powered electricity generation, the main thing we’re lacking is hydroelectric. (and what about nuclear?) But what does Millard County have that would be particularly attractive to High-tech companies? What does Millard County have that tech companies can’t live without? Talent? Workforce? How about electricity? Perhaps the single biggest thing all High-tech enterprises need is electricity. But most of the electricity generated in Millard County is already contracted to be delivered elsewhere. The reality, especially in light of the stiff competition, is that at this point Millard County is probably not a prime tech location. Some day, maybe. But it is highly unlikely that any big, high-tech company would locate a major data center in Millard County within the next decade — and probably longer. Most tech companies considered our Cedar Valley Project, just 30 minutes from downtown SLC to be Timbuku. I won’t mention the acronym they would use to describe a place like Millard County. That is not to say that Millard County isn’t a decent enough location for small-cap High-tech enterprises — especially if they are homegrown. And perhaps a bigger day will eventually dawn. And that isn’t to say that Millard County isn’t a fair enough spot for remote tech workers — in places where there is access to high speed Internet — with relatively low cost of living. That is a sector that even I work in. But remember, a growing number of today’s most talented tech workers want just the opposite. They don’t even want suburbs. They want to live and work in highly concentrated urban settings. And they want to commute via public transit. So, realistically, like our project in Cedar Valley, location, location, location being what it is, it is probably going to be decades before Millard County might ever be a very competitive relocation site in that industry. In the meantime, we need solid direction and solutions NOW. Realistically, just like the people that sold basic necessities of life — including picks, shovels and Levi’s jeans — during the California Gold Rush, it may very well be that Millard County’s more natural niche is less glamorous than becoming the Silicon Desert any time soon. I’ve discussed some of this before. SEE The Current Status of Property Rights in Millard County — The Struggle Continues. But if Millard County does seem to have a recognizable niche in the world, it is as a place where there are sufficient natural resources (including water) and raw materials (minerals, ag products, etc. ), coupled with essential infrastructure, far enough removed from existing and growing urban population centers, with enough space and elbow room, that productive enterprises have and ought to be able to find a productive home without all the urban pressure that exists In closer proximity to more metropolitan areas. Why did IPP (Intermountain Power Project) locate in Millard County? What about Graymont Lime Plant? Magnum Gas? Materion? First Wind? Crystal Peak Minerals? Large solar farms?. A growing number of large dairy operations? Industrial poultry operations? LiquaDry? Mountain View Mushrooms? Great Lakes Cheese? And now Smithfield Foods’ hog-finishing operations? Is it because of aesthetics and Millard County’s beautiful scenery? Or, as some have suggested, because of the county golf course in Delta? What is it that attracts farmers, agri-businesses and energy companies — productive enterprises — to Millard County? What is the common theme? They are all PRODUCTIVE industries. They produce, process, store and transport basic necessities of life. And they all have to deal with the practical realities of such production, extraction, processing, storage and transportation (no one, for example, has been able to discover how to prevent human or animal exrement from stinking). 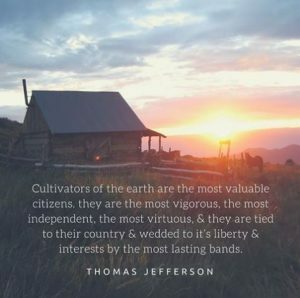 They are/were all looking for a place to produce and process with the right combination of natural resources, infrastructure, and advantageous location with enough elbow room that they can continue to operate and grow without everyone acting like they’re ruining the world. And Millard County already has many of the essential components and infrastructure in place — including great rail access. At this point these productive enterprises view Millard County as a place where they ought to be able to safely and economically continue to PRODUCE and process something of value – Food, Fiber, Energy, Minerals, etc., based on a combination of sufficient natural resources, and essential infrastructure, with enough wide open space and elbow room that hopefully they won’t feel like they’re going to be crowded out in the next five years. In short, they are looking for a place that respects basic, fundamental property rights. And I don’t see that changing. People and businesses that want to relocate to Millard County are not generally driven by aesthetics. Most often they are looking for a place to move where they can engage in productive enterprises without having everyone continually breathing down their necks, and trying to put them out of business. If Millard County wants to strengthen its economy, it needs to look no farther than it’s neighbor to the South. Although Beaver County has less than half the land mass, and only a fraction of the water resources Millard County has, and less than half the population, Beaver County has developed one of the strongest rural economies in the state of Utah. By dollar volume, Beaver County is the highest agricultural producing county in the state of Utah. And unlike Millard County, which has one of the highest property tax rates, Beaver County has one of the lowest property tax rates. And by comparison, just as IPP — Millard County’s biggest economic engine — is starting to wind-down, Smithfield Foods — by far the biggest economic engine in Beaver County — is looking to expand. But after riding the good economic fortunes of Circle 4 Farms for 20 years, when Smithfield contract growers sought to expand on the east side of the Beaver County, closer to I-15, they encountered opposition for the first time in 20 years. Apparently, even Beaver County is starting to raise NIMBYs. But the DFA cheese plant in Beaver certainly seems to be an asset. Have you been to DFA’s Cheese Chalet? Beyond the immediate freeway exit businesses, how many businesses in Millard County are capable of pulling that amount of traffic off the freeway, and in to town? In terms of brain-storming just a little bit, with a robust dairy industry in Millard County, and the high cost of transporting liquid milk, dairy processors like Dannon Yogurt, or Glanbia Cheese might seem to be a good fit. I know local truck drivers who are hauling liquid milk clear to Fallon, Nevada. While we’re having this discussion, let’s also consider the fact that although property tax base is great for local governments, tax base, by itself doesn’t do much for the local economy, per se. The thing that drives the local economy is JOBS — good, living wage jobs. And living wages are a big deal. Living wages can pay for a reasonably priced house and a car, and support a family. The good thing is, production industry jobs (as opposed to service industry jobs) generally pay living wages. And money that is earned and spent locally turns over at least seven (7) times in the local economy. The challenge a growing number of “producers” face in Millard County — regardless of their production methods — is the essential lack of understanding of fundamental property rights, that caused even our rural county commissioners to adopt an urban-based, over-the-top, one-size-fits-all county land-use ordinance built on a shaky foundation of disregard and disrespect for fundamental property rights. This serves as a serious obstacle and stumbling block to legitimate economic enterprise and business development. Anyone who has had significant business recruitment experience will tell you that micromanagement and overregulation kills business. Consequently, one of the most significant obstacles to any economic development is government over-the-top zoning and land-use ordinances. Many companies have already experienced that, and are looking for places to go that are actually “open” for business, and want to encourage and help business, instead of doing everything they can to control, micro-manage, and over-regulate business into the ground. Make no mistake, Millard County should be striving for a diverse, balanced economy. And realistically, there will be a place, and demand for local tech companies to develop and grow and provide competent tech-support options, but it is probably unrealistic, at least for the reasonably foreseeable future, to think that relocation of high-tech companies to Millard County will become the powerful economic engine that we need sooner rather than later. With a solid understanding of these realities, is it worth betting the farm on an unlikely high-tech silver bullet solution? Rather than attempting to pound square pegs in to round holes to compete in an economic race/rush that Millard County is not well-located or suited to compete in, at least for the foreseeable future a more realistic approach should be to get out of the way of the free market system; let the supply/demand forces of the free enterprise system work, and offer to provide a welcoming home to productive enterprises that are otherwise struggling to find welcoming places to locate. They are not in short supply. Millard County is well-situated to improve its economic prospects by focusing on enterprises that produce, process, store and transport the basic necessities of life, including food, fiber, energy, minerals, etc., . . . because, among other things, at the end of the day, if there is one thing all tech companies need, it is power — energy. And every single one of their workers has to eat. Although it may be less glamorous, there is still strong market demand for the basic necessities of life. Many of us dont consider ourselves moochers just because we are not food growers. There are many services provided by us all that makes the wheel go round. That being said, Todd makes an excellent point. The infrastructure necessary for tech is, power. We do not have the water reservoir power system and the redundancy of that structure to provide high quality power with 100% uptime. Millard County does have a lot of minerals though. I’m interested your suggestion that Glanbia Foods or Dannon would be a good fit for our economy and Millard County. What needs to happen to get Glanbia Foods, or Hilmar Cheese, or Dannon Yogurt in our neighborhood? Thanks JD. Good to hear from you. Great Lakes Cheese is by far the biggest economic engine in east Millard County. Think what life would be like on the east side, and what we’d have going without the cheese plant. Given Millard County’s central location, strong ag sector, robust dairy industry, etc., to me it seems like a no-brainer for food processing, and especially dairy processing. I think Millard County has some similarities to the Twin Falls, Idaho area, and we really ought to be studying what has been done to develop the economy there — which really seems to be thriving. But, having now spent a fair amount of time with the powers-that-be in Millard County government, including last night at the Delta Meet the Candidates event, I’m not sure prioritizing the food and dairy processing niche has really even occurred to anyone else. 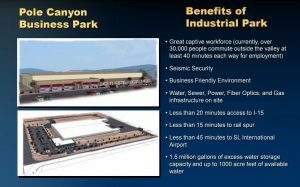 From my perspective, one of the things that would really help is if one or more Millard County landowner(s) could/would catch the vision and express interest in developing an Ag Industrial Park — with a first phase of say 1000+ acres with good infrastructure, and develop it into 10+ 20-100 acre pads, where everything from industrial hog and poultry farms, to dairies, food processors and packing plants could cluster, and help Millard County pursue that niche. Millard County has always had a strong agricultural base. In addition to energy production and mineral extraction, I think food processing is a good, natural fit for Millard County. And it provides good, basic living wage jobs. I agree with the comment that Millard County has a lot of minerals. It would be cool if they would get rid of the wilderness study areas and actually do something productive with the land. There are a lot of things that could be improved on in the aspect of mining. Some of it would probably at a higher level, but if it is production we are wanting, Millard County has the resources. We have plenty of copper,lead, tungsten, iron, gold, silver, etc. Right you are HR. It is about property rights. As you know, Todd is the only candidate concerned about property rights. 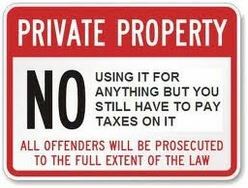 Whether it be your back yard or our Counties community property. The time to put big government in check is now! State, Federal and local. It starts at the local grassroots level. Time to get some new blood in Millard County politics. Neuel is a wise beyond his years. Millard county offers absolutely nothing to High tech companies. The only silver bullet you can hope for here, is a run on the price of manure. So you better keep those dairies and pig farmers happy. I think the acronym you are looking for is BFE.